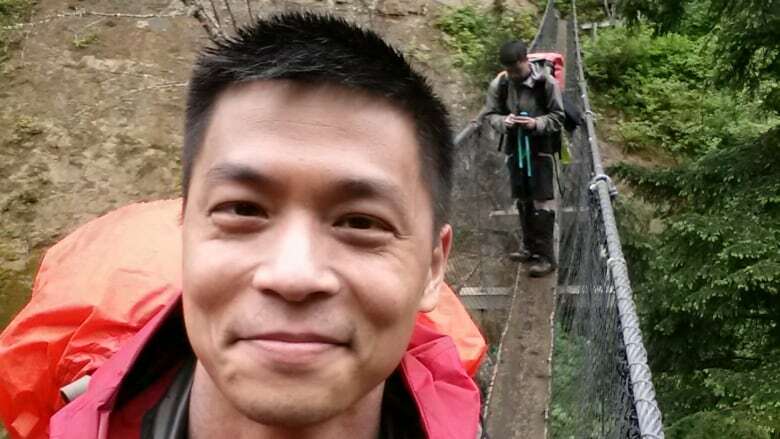 CBC Vancouver News at 6 host Andrew Chang snickered when the pre-hike orientation warned it could take as many as 90 minutes to cover one kilometre of the trail's most difficult section. And then he started hiking. When the expert leading the pre-hike orientation session suggested it could take as many as 90 minutes to cover one kilometre of the trail's most difficult section, I snickered to myself. Sure — maybe if you're crawling on your hands and knees. But then my two cousins and I embarked on the first kilometre of trail. And yes, it took us 90 minutes — a long time, considering, on flat ground, the average person walks about five kilometres an hour. Oh, and you have to do it all carrying 40-or-so pounds of tent, clothes, food and gear on your back. And don't forget the ladders. Our orientation session only lasted about 35 minutes, but the subtle suggestion was that there were 35,000 things that could go wrong. Every year, nearly one in every 100 hikers doesn't make it to the end. Parks Canada is keen to remind first-timers of that. And so far this season, it looks like that number could be higher. 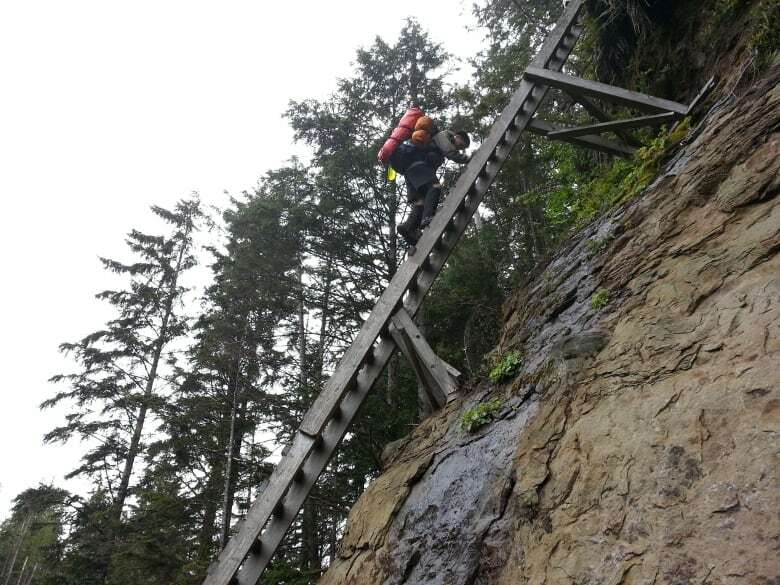 With the hiking season just beginning, Parks Canada's safety team has already had to evacuate 10 people from the trail due to injury. To compare: last year, by the end of May, there had been just two evacuations. Hypothermia is one potential issue hikers face — especially during the colder months. 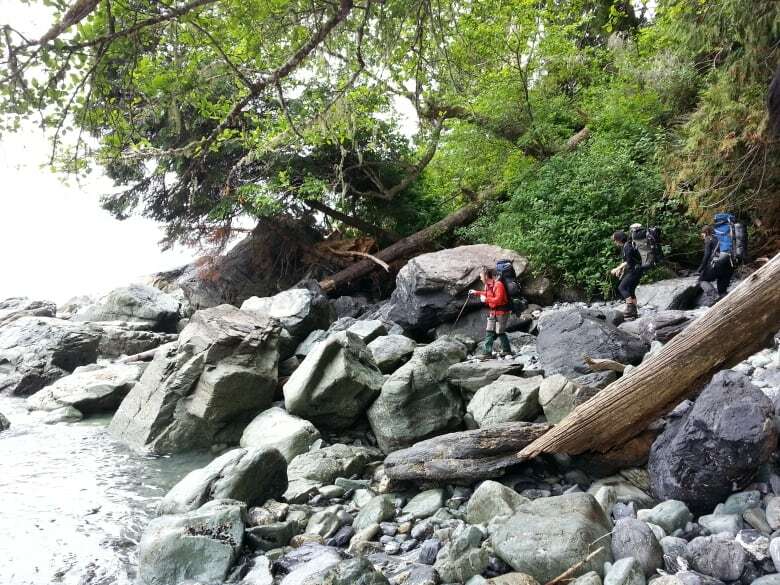 It rains — a lot — on the West Coast Trail, and if hikers don't take care to keep their clothes and sleeping bag dry, or if they get stranded in bad weather by high tide, they're in for a world of brrrrr. There's also the occasional run-in with bears, wolves and cougars: 40 or so each year on the trail, on average. Fortunately, nearly all such encounters end amicably enough: both parties back away cautiously (hearts beating a little faster than usual, perhaps) — and sure enough, you'd have to look back all the way to 1985 to find an actual, documented cougar attack. But by far, the biggest problems are slips and falls. During my seven days on the trail I met two people who took bad spills. 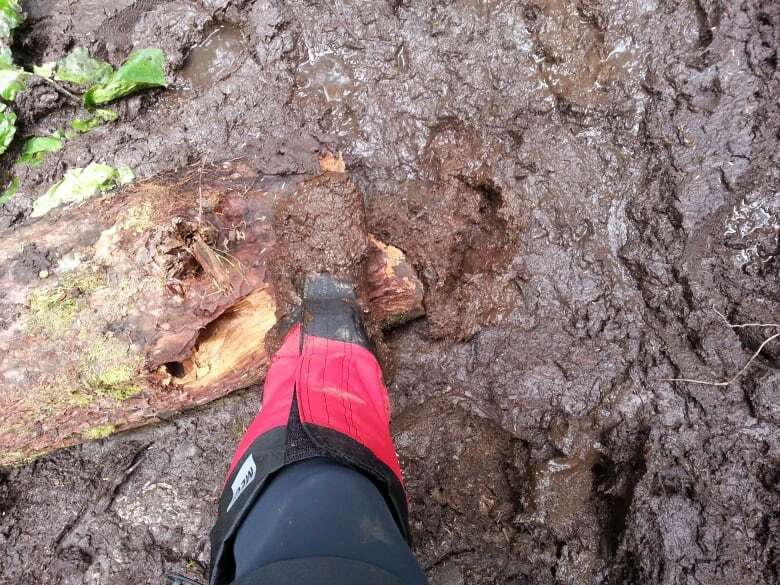 One young woman took one wrong step — slipping off a muddy log in the woods. And though the log itself was only a foot or two off the ground, it's not the fall itself that gets you: it's what you land on. Everywhere, there are rocks jutting out. Branches as thick as your wrist poke in strange directions. In fact, it's not uncommon to see entire trees teetering over, frozen in time at 45-degree angles. The young woman's friends told us when she fell, she'd hit her head and blacked out for a while. By the time I arrived, she was awake and smiling, but had two chipped teeth and a broken arm. Rescue teams evacuated her that night — having to help her down a series of ladders and onto a beach, where a waiting Zodiac took her to safety. Another hiker I'd met also took a tumble, hurting her knee. She hobbled along for about two days, until she decided the pain was getting worse. She needed to be evacuated as well. I survived the trip, but that's not to say there weren't moments where I was seriously wondering how it all might end. There was one sunny afternoon where we were hiking along the coast for hours. We were looking for one particular turn-off heading inland — marked on our map. 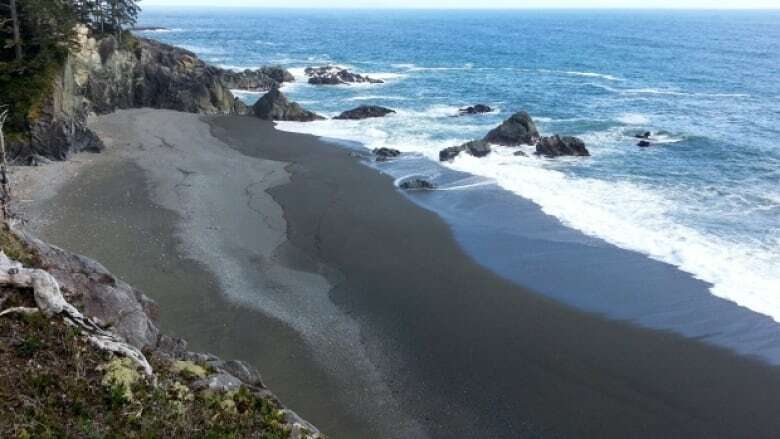 The alternative was to continue along the coast and eventually hit a dead end: impassable terrain. Sometimes, that impassable terrain is a dangerously large surge channel: essentially a big trench cut across the rock you're standing on, separating you from solid ground on the other side. You can't go around, because one end of the trench is sheer rock wall; the other end is ocean. Inside the trench is water — sometimes deceptively deep — continually surging in and out with the tide. You cross those at your own risk. On that particular day though, it wasn't a surge channel we came across. It was more like a small cliff. Peering over the edge, it looked to be about a storey high and quite steep. 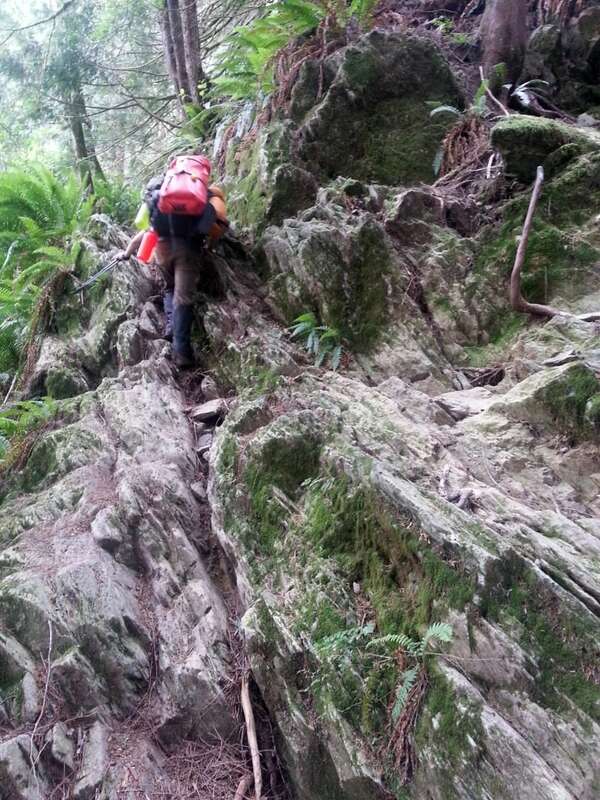 It might not have been the kind of rock face you'd see in Sylvester Stallone's Cliffhanger, but it was enough of a drop that if you were to lose your footing and fall -- under the crushing weight of your backpack -- you'd break bones. So my cousin, Jeff, took off his pack. Now packless, he slowly climbed down the rock face — stopping about halfway. He peered around, examining the nooks and crevices he was contemplating latching on to. I dared not say anything, for fear of startling loose his grip. It was only after another moment's observation he'd decided that climbing all the way down was, strictly speaking, do-able — so he climbed back up to give the rest of us the good news. The only catch, of course, was that now we'd all have to do it — and with a combined 125 pounds on our shoulders. It wasn't until we'd come across a so-called Guardian Cabin, we'd realized we'd gone off-course. A Guardian Cabin is where First Nations keep watch, and occasionally help hikers along their journeys (providing information, directions, and even 'comfort tents', complete with wood stoves — for a fee). The first thing the man at the cabin asked us: "Where did you guys come from? I saw you coming from the beach, and thought: what the heck?" Let me explain. The only way to get to that cabin is supposed to be from the woods. Coming from the beach, we must have appeared as sea creatures from a horror movie: materializing from the water, marching ominously towards land. I replied: "It wasn't easy. There was a lot of climbing involved." "Yeah over the rocks?" He asked. Then every ninth word out of his mouth from that point on was some derivative of wowieee, sheesh, yikes, or a disbelieving, incredulous chuckle. We counted ourselves lucky, and decided we should take the woods the rest of the way, until we reached camp. 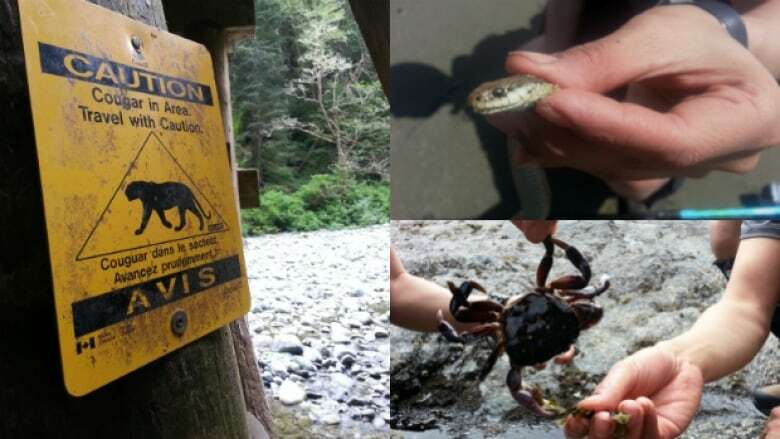 So is the West Coast Trail dangerous? But not in a moment-by-moment, life-hanging-in-the-balance sort of way (unless you deliberately put yourself in those situations, like we sometimes did). The greater issue is one of endurance. The trail wears you down. There are moments where you'll ask yourself: how much farther can I physically go? What if the pain doesn't go away? Am I going to make it? Is this worth it? And on your 34th hour of hiking: over rocks, under fallen trees, through mud, sand, and rain, battling Mother Nature while waging a small war with your own growling stomach, trying to ignore that blister on your big toe, but preoccupied with whether you'll beat high tide and make it to your next camp site before dark — that's when you slip. It's then, when you let your mind wander into the realm of Gosh I'm Tired, you hit a patch of wet wood, or step carelessly onto a wobbly rock without being ready for it. That's how most West Coast Trail adventures end. But while it's scary to think that as many as one in 100 hikers never finish, the flip side to that coin is that 99 do. And for those people, I can tell you first-hand: the journey is absolutely rewarding. 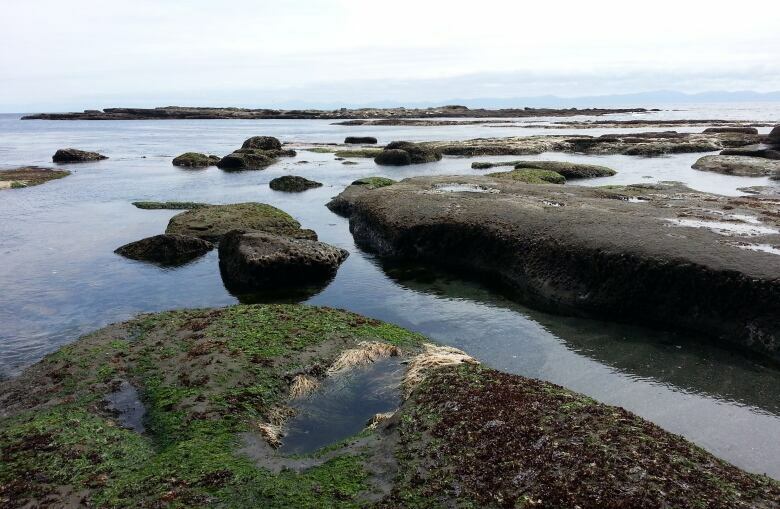 On the trail, you'll see otters, crabs, fish, eagles, snakes, whales, and sea lions — not to mention all the interesting plant life. Also: if you've only ever camped in the woods, beach camping is a real treat. There's something about hearing the ocean roll in and out while you sleep that's wonderfully calming, rhythmic and predictable. And then there's the raw beauty of the natural environment. Secluded waterfalls. Pristine lighthouses. Vast tidal flats. Endless beach. Enchanting caves. Ancient trees. Isolated swimming holes. And near limitless opportunities for exploration and adventure. It's an immensely fulfilling experience, requiring equal parts preparation, mental fortitude, and physical stamina. The best thing about doing the West Coast Trail is finishing the West Coast Trail. And take it from me: when you finally see that last cabin — a mirror image of the one you started at, but 75 km away — it is a very, very welcome sight indeed.